Even the most safety-conscious motorcycle riders can be vulnerable while out on the road. Although Southern California weather is generally hospitable for riding year-round, other drivers can be inattentive and put you at risk, and even the road itself can be a safety concern. If you’ve been hurt in a crash caused by debris in or damage to the road, you might be entitled to compensation for your injuries. Speak with an Antelope Valley motorcycle accident attorney as soon as possible after a crash to determine whether you should take legal action after a crash. If you’re an experienced motorcycle rider, you know that the narrow tires on your bike can fall prey to roadway hazards that simply wouldn’t be an issue for a passenger vehicle driver. While gravel that was carelessly allowed to spill over from a CalTrans work site might be a pesky inconvenience to a car, it can lead to uncontrolled skidding for a motorcycle. Potholes long allowed to remain unfilled can swallow a bike’s front tire. Roadway design can even play a part in accidents. If a sharply-curving road is not properly banked, or if the signage provided fails to adequately indicate the speed at which drivers should be traveling around the turn, a motorcyclist can end up losing control of their bike, or even on a head-on crash course with opposing traffic. With few exceptions, it is either state or local government that is responsible for competently designing and maintaining roads. 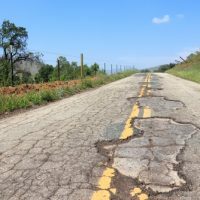 Depending on the location of the road, either a local municipality or a state office is tasked with regular maintenance and repairs. Under the doctrine of sovereign immunity, there are limits placed on the sort of lawsuits that can be filed against a government entity. Only where a government body has been especially negligent in failing to acknowledge a known risk of harm caused by a defect in the road will they be liable for damages caused by that hazard. An attorney experienced in claims against the government can walk you through the process of proving that their negligence caused your injuries, and can help you navigate the procedurally-complex world of pursuing a claim against a state or local government office. If you or someone you love has been hurt in a motorcycle accident in Southern California, contact the experienced and compassionate Palmdale personal injury attorney Paul Kistler for a consultation on your case, at 661-206-6990.